tips, parking fee and any other expense not includes in package cost as above. Cost of any additional day stay which is not included in package will be charged extra. Service Tax if any will be charged separately as applicable as per Govt. rules. Reception at Siliguri- NJP/Bagdogra. 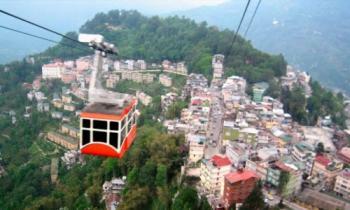 Proceed to Darjeeling. Enjoy on the way the green belt and natural beauty of Himalaya. Check in at hotel in Darjeeling. You have free evening and you can visit local Mall and market. Overnight stay at Darjeeling. Early morning visit Tiger Hill and enjoy the spectacular sunrise over the Kanchenjunga (28,208 ft. Worlds 3rd highest peak). And also visit to Ghoom Monastery and Batasia. Return to hotel for breakfast and after breakfast visit Mountaineering Institute, P N Zoological Park(Thursday closed), Tibetan Refugee self-help centre(Sunday closed) and Tea garden(outer view), Tenzing Rock .Overnight stay at Darjeeling. Proceed to Gangtok -enjoy on the way the green belt and natural beauty of Himalaya. Check in hotel at Gangtok. Overnight at Gangtok. Early morning - Excursion to the frozen lake Tsongo (12,400 ft, 40 kms from Gangtok), Baba Mandir (13,200 ft.), - back to Gangtok- Free evening to visit and roam around in M.G. Road for shopping- Night stay at Gangtok. Gangtok local sightseeing-- Tashi view point , Eanchey monastery ,Bakthang water falls , flower show ,Rope way ,Tibetology ,Chortan Stupa ,Nam-Nam view point , Handicraft . Overnight stay at Gangtok. Proceed to Siliguri - NJP/ Bagdogra Airport. Tour End. Sharona Travels will not be responsible for any kind of accident, theft, civil disturbance, natural calamities and other such incidents which are beyond human control. Hotels once booked cannot be altered. No refund is admissible if a tour is cancelled or alter at the last moment due to unforeseen circumstances beyond human control. Additional cost arising due to mishaps, political unrest, natural calamities like –landslides, road blockage, etc. will have to be paid on the spot by the guest directly . Cost for any increase in taxes or fuel price, leading to change in package cost, which may come into effect prior to departure. Extra charges are applicable for the vehicle used apart from the itinerary. Tour Itinerary may be altered/revised without prior notice because of holidays, inclement weather conditions etc. However all the sightseeing spots mentioned in the itinerary will be covered. As the vehicle & drivers may keep changing sector wise, we request you to take diligent care of your personal belongings throughout the tour. Payment Term: 50% advance on booking and balance 50% to be paid before 15 days from start the tour.